← Jupiter met Uranus, 8.6.10 : Calm down – we’re still here! This entry was posted in Jupiter/Uranus conjunction 2010/11, Phase 1: 8th June 2010 (6 articles) and tagged "Jupiter meets Uranus", 14-year Jupiter/Uranus cycle, 1997 Jupiter-Uranus conjunction in Aquarius., 2010/11 Jupiter/Uranus conjunction, AFA Newsletter, Amazon.co.uk, Anne Whitaker, upcoming Jupiter-Uranus conjunctions in Pisces and Aries., Uranus in Aries, Writing from the Twelfth House. Bookmark the permalink. I appreciate your candor Anne, and yes, perhaps I am a bit impatient. I never attempt to “predict” transiting Uranus due to its very symbolism, however, I can usually “see” the area of influence even though I do not attempt to interpret the outcome. I have not experienced anything…not even a hint, internally or externally.The grand cross configuration consists of Saturn conjuncting my Sun and ascendant, square my MC with Pluto on the cusp of my 4th house, square my Sun and ascendant, opposition my MC. I think I might be a bit on the nervous side about the Pluto position. 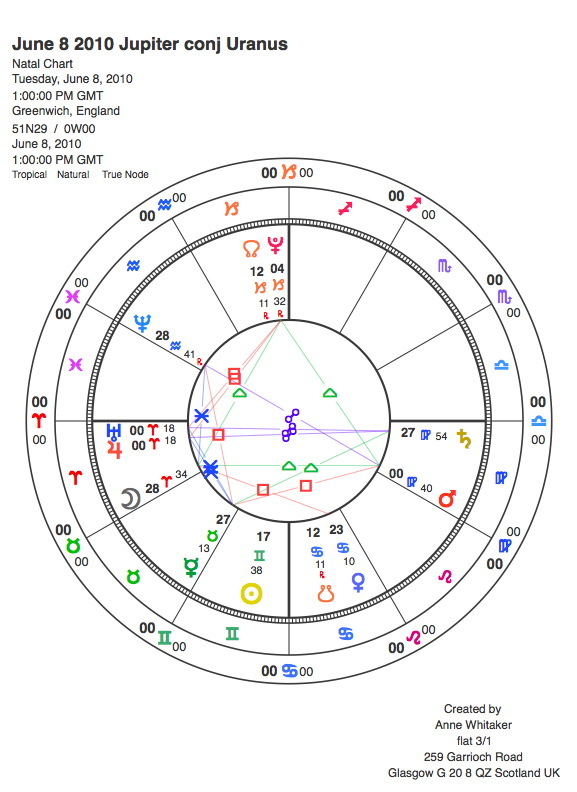 My 32-yr old daughter died rather unexpectedly in October 2009 and although the aspect wasn’t exact, the orb was within range and Pluto had just re-entered Capricorn. I believed it was Pluto heralding its arrival and it has put quite a fear in me regarding other family members. Of course there were many other factors to consider, but the absolute finality of her death has shaken my core (Pluto). It has also led to a complete restructuring of my family relationships…some for better, others completely severed. Along with her death, I lost 4 of my grandchildren to their respective father(s), two children to each dad and I haven’t been allowed to see or speak to them…a double trauma, as they are all I have left of her. None of this seems related to the Jupiter/Uranus conjunction, but I am wondering if I am simply “frozen with fear” and unable to express what would be my usual self. Perhaps I am blocking this potential gift? Any and all feedback would be much appreciated. The main body of my reply was sent as a private email to Sherry. Here is an extract, relevant to her query about the apparent non-manifestation of the Jupiter/Uranus energy…. from my astrological work,and I know just how long it takes to process loss and pain. Sherry, you expressed pleasure and surprise to me at being part of this research project. I am still reeling with surprise myself since after the 1997/8 research I remarked to my friends and family that NO WAY would I be mad enough to take on such a project ever again. (Tip, you guys out there: Never say never!!!) But I also feel an undertow of reluctance in the face of all the work – and have been putting off writing the protocol for the last week! This is the Saturn/Pluto effect I have just been talking about which I think we will see across the map, as it were: from eg the big picture manifestations of this huge and protractedly difficult to fix oil explosion disaster in the Gulf of Mexico, to the upheavals, frustrations and delays in breaking new ground in our tiny personal lives. As you said at the outset of your comment, Sherry – patience, that’s the key. And faith, that the planetary symbols are outworking in ways which can bring in fresh, positive energy if we work with them as consciously as we are able…. Be careful there :-)…The last Jupiter/Uranus conjunction was in my 5th house. I was 43. Had already raised 4 children, youngest was 17. Both of my daughters experienced sudden unexpected pregnancies within 8 weeks of each other and of course I thought, “this is the transit”…3 months later I found myself pregnant against all odds. So, I have a daughter the same age as 2 of my grandchildren. Talk about unexpected! She was definitely my Uranian “twist”. Anything is possible! Sherry, wish I’d had you as a subject for my 1997/8 research on the outworking of the last Jupiter/Uranus conjunction, as per this astonishing feedback! Well, so far the transit had been about bad news mostly. My adored acupuncturist friend died of rectal cancer at 54. She had 4 planets Scorpio plus the Asc. with the Moon conjunct Neptune 0 degrees Scorpio. Her husband has Moon Virgo 0 degrees-the conjucntion makes a yod in their charts. She did survive way longer than I expected. She was a luminous being. Another friend with lung cancer. He has been smoking for 50 years but still sad as he is a very helpful person on the planet. Granddaughter with 1 degree Cancer Mars and close Mercury is going to lose a tooth from dental phobia. Should have paid her dentist instead of going on vacation in Puerto Rico, I guess. Another granddaughter is pregnant which she fervently desired, but now reality is setting in – but hardly a cause for lamentation. Grandson in law unexpectedly competent, smart and pleasant-good father material. Another acquaintance with 0 Aries had cataract surgery successfully. I am sick of all my usual pursuits and sick of antibiotics, craving something new and different. What patience? Yes, there has been quite a bit of bad news around lately – I have seen this too in the context of my own, relatives and friends’ lives, to a greater degree than usual. As I reflect on the research study and how best to set it up, I have also been reflecting on the particular power of this Pisces/Aries shift as the backdrop to the 2010/11 conjunctions. 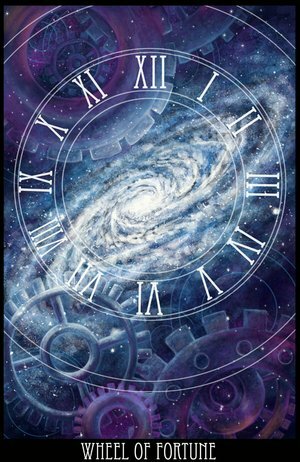 The end of an old cycle, and the start of a new one, happens every 14 years with Jupiter/Uranus. But this one is potentised, I think, by its occurrence at the end of the very Zodiac cycle itself with Pisces, and the start of a new one with Aries. There is something very literal and potent here. And the scything back of the old order to clear space for the new to emerge, can be seen manifesting very harshly. This could be why there seems to be so much death around, both literal and symbolic. The Gulf of Mexico disaster at a collective level, may signify the protracted death of the illusion that humans can intrude on the deep fabric of our planet without great penalty. Hopefully the ‘something new’ that emerges from this death can wring more responsible behaviour out of us re Mother Earth…..
Another death in my realm…I’m a Child Protective Services Investigator. Had an 11-year old boy die in his sleep last Sunday (not a suspicious death). He had a heart attack. Tragic. Parents are devestated. Was difficult for me to offer support and comfort to the family as it brought back a lot of pain surrounding my daughter’s death. thank you for your openness again. There is nothing I can think of to say in relation to this feedback which would be adequate. Except that I feel for you from my own experiences of loss, and of having had to support people in my professional life through desperate tragedy. Perhaps my response to Anna, above, can offer a little perspective on the larger scale.